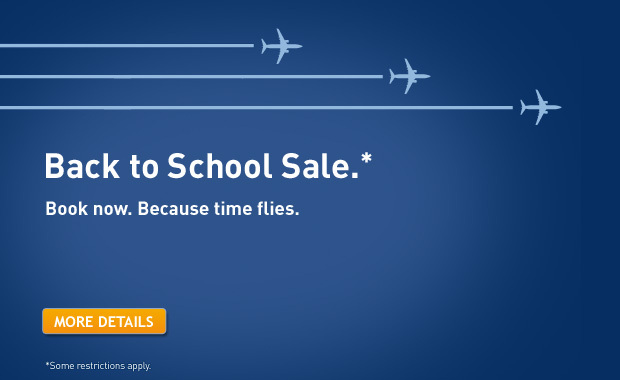 How to get this offer: To redeem this offer, bookings must be made on westjet.com. Both the promo code and coupon code are required at time of booking on the first page of the booking process. Percentage is applied to base fare excluding taxes, fees and charges. Discount can only be applied towards fares displayed in the Econo or Flex category. For travel between September 5 and December 17, 2013 and between January 5 and February 12, 2014. Book by August 29, 2013, 11:59 p.m. local time, from your city of departure. Blackouts apply December 17, 2013 to January 5, 2014. Valid on Tango and Flex fares. For travel from August 26, 2013 until February 12, 2014 except from December 15, 2013 to January 7, 2014. 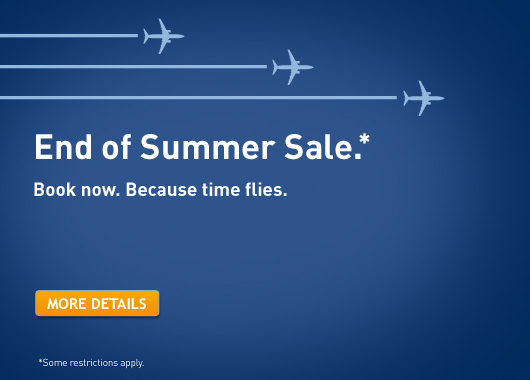 Click here to book a flight on WestJet.com now or for more details about the seat sale. 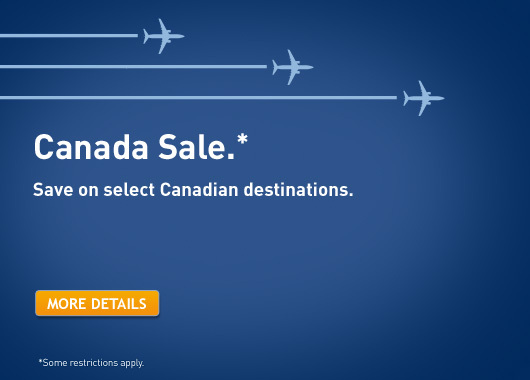 Click here to book a flight on AirCanada.com now or for more details about the seat sale. 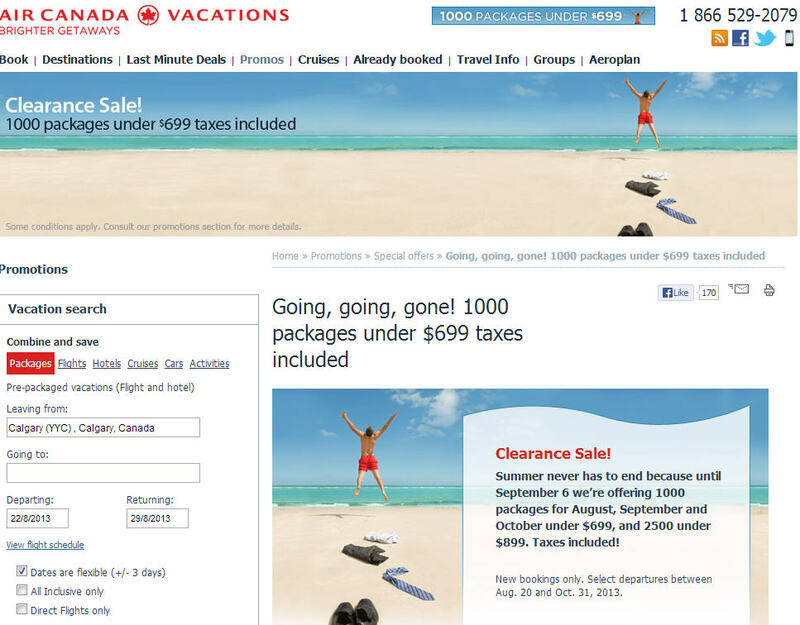 Air Canada Vacations is having a huge Clearance Sale! Until September 6, 2013, they’re offering 1,000 vacation packages for August, September and October under $699, and 2,500 under $899 including taxes! The offer is valid on new bookings only with select departures between Aug. 20 and Oct. 31, 2013. I browsed around and am very tempted to book something even though I just came back from a vacation last week. Click here to visit AirCanadaVacations.com for more details. Since all WestJet & Air Canada do is price match each others seat sales, they are both offering an extra 15% off select flights within Canada. You must book by August 15, 2013 for travel from September 3, 2013 to February 12, 2014. Blackout dates apply from December 17, 2013 to January 5, 2014. How to get this offer: To redeem this offer, bookings must be made on westjet.com. Both the promo code and coupon code are required at time of booking on the first page of the booking process. Percentage is applied to base fare excluding taxes, fees and charges. Discount can only be applied towards fares displayed in the Econo and Flex category. For travel from September 3, 2013 until February 12, 2014 except from December 17, 2013 to January 5, 2014. Book by August 15, 2013, 11:59 p.m. local time, from your city of departure. If you need to book a hotel, check out Hotwire.com, Hotels.com, and Priceline.com. These are the 3 websites I use to book a hotel room. Hudson’s Bay is having a huge luggage sale! 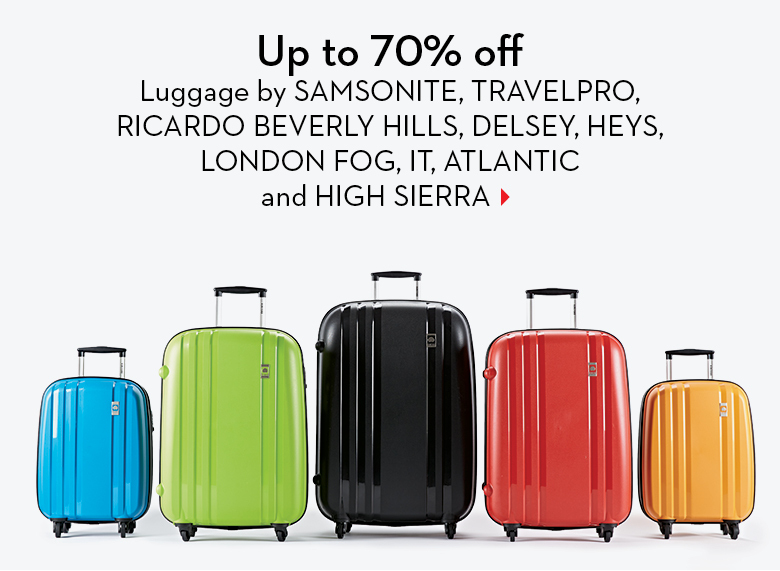 You can save up to 70% off luggage by Samsonite, Travelpro, Ricardo Beverly Hills, London Fog, High Sierra plus much more. At the time of this post, there’s over 125 items to select from. This is a limited time offer while supplies last. Hudson’s Bay offers free shipping on orders of $99+ or only $45 if you have a HBC Credit Card.